Vietnam is imitating China in its efforts to grow economically and lags its larger neighbor only by about a decade, experts say. China opened that effort to foreign investment in 1978 and Vietnam got started 10 years later. Now Vietnam is grappling with corruption, traffic gridlock and the sinking performance of state-run companies as its middle class grows, all hallmarks of China’s development. In the latest sign of similarity, Vietnam’s National Assembly is examining a bill to let the country run three special economic zones. It has a chance of passing next month. The zones would offer foreign factory investors tariff exemptions and long land leases, Vietnamese news website VnExpress International says. China created its first four zones in 1979 to attract foreign investment. It now has 32. “I don’t know whether it’s deliberate or otherwise, but it seems there is that hint of taking that page from the CPC playbook — Chinese Communist Party,” said Song Seng Wun, economist in the private banking unit of CIMB. Reliance on factory work, especially for export, drove Chinese economic growth of about 10 percent per year over the decade to 2010. Vietnam’s economy has expanded at more than 6 percent annually since 2015. FILE – Laborers work at TAL garment factory in Vinh Phuc province, Vietnam, May 23, 2017. Companies from Japan, Singapore, South Korea and the West often offshore factory work to China as well as Vietnam to save on labor costs. China has been dubbed the “world’s factory” and Vietnam a “China+1” destination for investors looking to expand production to a cheaper country. Five years ago Vietnam’s ambassador to Singapore called relations with the fellow Southeast Asian country a model as trade links were growing then. Vietnam, though dependent on China for trade, regards China as a political rival. They fought a border war in the 1970s and now dispute sovereignty over parts of the South China Sea. The number of Vietnamese who are middle class and higher will double between 2014 and 2020 to about one-third of the country’s population of 93 million, the Boston Consulting Group says. China says just 3.1 of its 1.38 billion people lived in poverty last year. In other signs of following China, Vietnamese workers are known for job hopping within a few months for higher pay and showing it off with expensive smartphones, new cars and meals at expensive restaurants. Traffic is starting to thicken in the financial center Ho Chi Minh City as it has in China’s major cities such as Beijing and Shanghai since 2000. Vietnam’s crackdown on corruption that went public in 2017 also followed the Chinese anti-graft campaign that experts say became more rigorous in 2012. 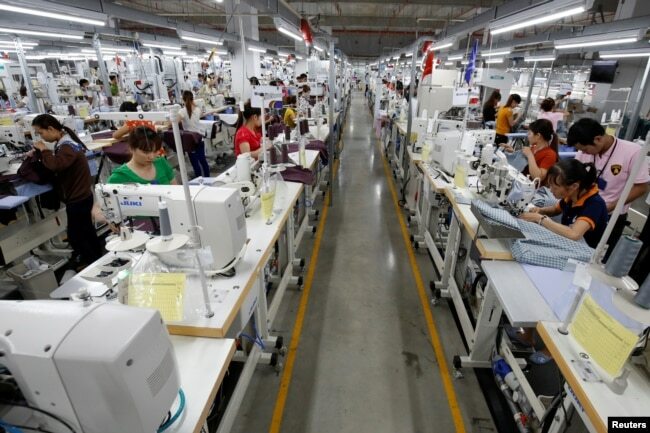 It’s Vietnam’s turn now to make its state-owned firms perform well or be sold off, analysts say. State-owned enterprises, another feature of communist countries, dominated the Vietnamese stock exchange from its inception in 2000 through 2005 as those assets were sold, said Kevin Snowball, chief executive officer with PXP Vietnam Asset Management in Ho Chi Minh City. Thousands of Vietnam’s state firms have been all or partly privatized. China began reforming its state firms about 20 years ago and is still pressing them to change following a decline in profits in 2015 due to issues with corporate governance and labor productivity. “Vietnam established the stock market in order to sell state assets basically, because when it started, essentially everything that was listed was state owned up until the end of 2005,” Snowball said. “The government needs to spend probably 25 billion dollars a year on infrastructure development in order to keep encouraging (foreign direct investment) to come in, and sale of state assets is partially funding that,” he said.